The poor Tin Man has been through a lot! Have you ever wondered about his back story? He used to be a woodsman, a very clumsy woodsman. Actually, that's not fair. The Wicked Witch cursed his ax after he rebuffed her love. For some reason, the munchkin community decided to replace his arms, legs, and well. . . the rest of him with tin. Hmm, well it turns out that tin doesn't make a great medical grade material. It rusts. So, before Dorothy came along he was simply stuck after getting caught in the rain, hoping some observant passerby would hear him squeak "Oil can". Well, it could have turned out worse. The Tin Man was lucky to find his group of odd balls, how else would he find the strength to head to Oz? There's nothing like a goal to give you a brand new lease on life! Anyway, his look is pretty cool. As long as no one puts magnets on his back, he's got plenty of dignity in stunning silver. He's not nearly as susceptible to the outside world as the rest of his friends. You won't see him high tailing it when you light a match or hiding when little Toto barks. His only weakness? Simple old water. We've got good news! Pesky water will be no problem when it comes to this slick Tin Man costume for children. It might look sharp but it's actually made with a soft satiny fabric designed to give off a metallic sheen. The ensemble features a shirt printed with metallic details and the heart given to him by the Wizard, pants with shoe covers, and the classic oil funnel head piece. 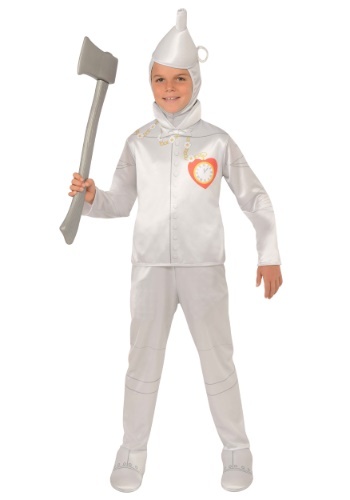 To finish off the look, paint your child's face silver and invest in the silver Tin Man ax. Your child will love dressing up as this classic character, their main line is even easy to remember, "Oil can, oil can"